Warren, a feisty little koala, is frustrated and annoyed because since the days of Captain Cook, people have called koalas bears, and he really wants everyone to know that koalas are NOT BEARS--unfortunately even Kangaroo and Platypus are not impressed by his argument. G'day, my name is Warren and I've got something to share...Just because I'm furry DOESN'T MEAN THAT I'M A BEAR. Koala is sick of being called the wrong thing. Koalas are NOT bears, and it is time that everyone knows it! Follow this feisty little koala as he explains why he is certainly NOT a bear (and why no one ever seems to believe him). 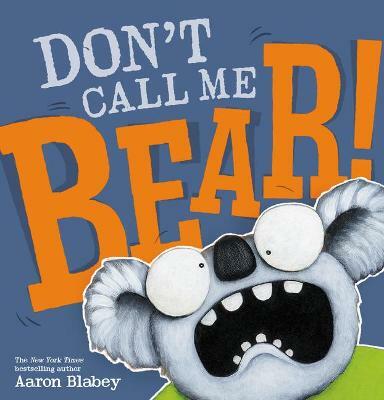 Rich with author-illustrator Aaron Blabey's hysterical text and unforgettably wacky illustrations -- plus nonfiction facts woven throughout -- Don't Call Me Bear is a hilarious story about making sure everyone knows exactly who you are!